Valentines Day is soon approaching! This year, WOW her more than ever with the gift of diamonds and high-end jewelry. Whether you are planning on getting engaged or want to give her a gift she will always remember and wear every day, women still agree, "Diamonds are one of the most special and memorable gifts they can receive on Valentine's Day." Yes, it is still possible to buy a beautiful 3+ carat diamond engagement ring for under $14,000. Consider a ravishing choice with a large carat weight clarity enhanced diamond set in an elegant, classic solitaire ring. Today we are showcasing a 3.61 carat Cushion Cut Diamond with a highly desirable VS2 clarity, F color, and Excellent symmetry. This clarity enhanced diamond is eye-clean. Its extraordinary sparkle and impressive size that appears close to 4 carats will make her the envy of all of her girlfriends this Valentine's Day. This diamond is beautiful enough to stand on its own in an 18K white gold, traditional-style solitaire setting, modeled after high-end engagement ring designs. Watch the video and witness amazing sparkle! 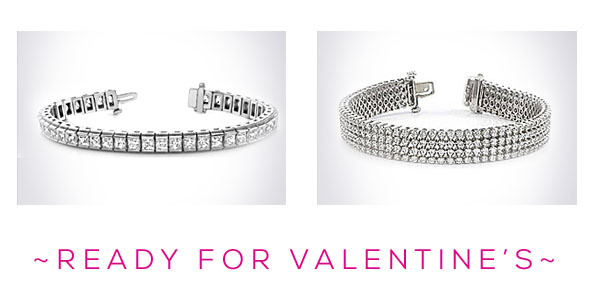 Light up her wrist this February 14th with a lavish gift every woman secretly craves... the diamond tennis bracelet. Available with one row of diamonds to four, Hadar Diamonds offers tennis bracelets for every personality, in every price range. Have a special design in mind? Our designers can meticulously craft any arrangement you can imagine. For custom designs, CAD drawings are sent to you prior to making her new treasure. To learn more, contact us and we will help you determine what size and style is most appropriate for her taste. Looking for a gift she will wear every day? The forever classic diamond stud earrings will make her sparkle all throughout the year. 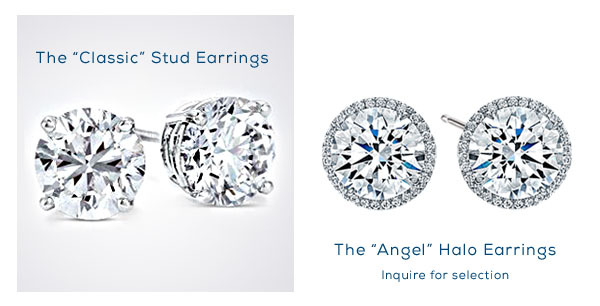 Diamond stud earrings are a unique gift in the way that they are versatile and wearable for any occasion. Many women wear their diamond earrings on every day—from the gym and yoga, to the office, and even to the most elegant affair. The versatility of diamond earring studs is why fashion mavens all over the world consider diamond studs to be a "fashion basic," meaning that they are a staple in a classic wardrobe. For size, women are traditionally happy with 1-1.25 total carat weight. However, when it comes to diamonds, many women agree that they would be elated to have the largest diamonds they can afford. This is where considering clarity enhanced diamonds can make a difference. This type of diamond allows your lovely to flaunt larger sizes at prices that are within reach. Does she have a costume jewelry piece she cherishes? For the ultimate surprise and Valentine's Day gift, have it modeled with natural diamonds, gemstones, and gold or platinum! Perhaps she found a bracelet, ring, or necklace that she purchased at a department store years ago, even before you met. She wears it often, and it is starting to show how much it has been loved. How about making her treasured trinket into an heirloom quality piece that will last an eternity? Common requests include diamond hoop earrings, vintage jewelry that is no longer made, and recreating vintage necklaces and bracelets to include high quality metals, diamonds and gemstones. Of course, romantic touches, such as including your initials in the design, can be incorporated into a Valentine's Day gift she will always remember. To start, simply email or text us photographs of the idea, and we can quote the price for you. For more information on how to gift the special woman in your life this Valentine's Day, contact us.